All you have to do is breathe deep and go. Feeling guilty because you neglected summer Shakespeare in the Park for marathons of True Blood and The Walking Dead? 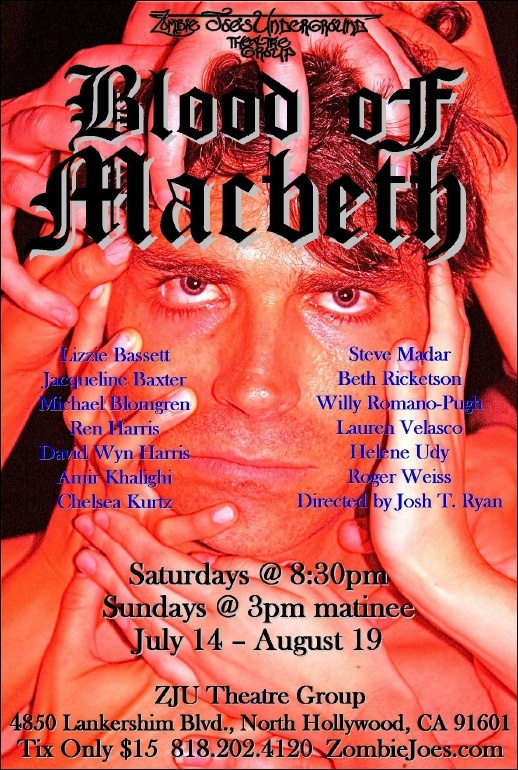 Satisfy your appetite for blood and the Bard at Zombie Joe’s Underground Theatre Group where The Blood of MacBeth has been extended for two more Fridays through September 28. Josh T. Ryan’s over-the-top, roller-coaster-of-a-ride interpretation focuses on the thin and terrifying line between sanity and madness — a fact that will be abundantly clear in the opening scene when seven insane and/or imprisoned men abuse a mannequin on stage. Ok, maybe there’s a little of Oz in here too. As for the three Weird Sisters? There’s seven of them, they’re funny, and they wear fishnets. Note-taking for Halloween costumes encouraged. 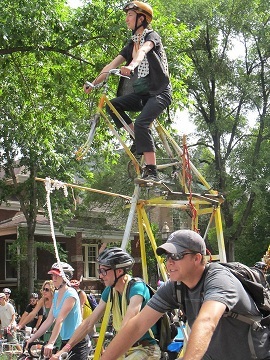 Towering above the competition: Tall Bike at Tour de Fat. It’s the last weekend of summer…so it’s a given Saturday will sizzle. Good thing you’ll be celebrating with free beer, free music, and a gazillion bikes at the New Belgium Tour de Fat at the Los Angles Historic State Park. The “ballyhoo of bikes and beer” kicks off with a parade for costumed bike riders and decorated/bizarre bikes. It’s a go for the unicycles, Go Go’ers! The hoo rah rah continues with music by Los Amigos Invisibles, Sister Sparrow And The Dirty Birds, Yo-Yo People, and Sssnakenstein and beer from New Belgium: the Fat Tire folks who work tirelessly to bring you beers like “Peach Porch Lounger” and “Red Hoptober”. Beers that you just happen to work tirelessly to consume. The cycle shindig culminates in the selection of one volunteer, who has already submitted a persuasive video pledging to go car free for a year, who will swap their car keys for $2,250.00 to custom-create a cycle at a local bike shop. The car will be auctioned off by Cars for Charity; proceeds will go towards local bike operations such as C.I.C.L.E., the L.A. County Bicycle Coalition, and theBicycle Kitchen. And if you don’t have a bicycle? Well, you still drink beer, don’t you? NEW BELGIUM TOUR DE FAT — Sat, Sept 15, 9am – 5pm; FREE — L.A. State Historic Park, 1245 N. Spring Street, DTLA, 90012. Complete schedule here. Listen to Stan, the man, the legend. Go Go’ers, think of Stan Lee’s Comikaze Expo as a premier Halloween preview. Now in its second year, the convention of “comics, gaming, sci-fi, fantasy, anime, horror, and pop culture” is newly affiliated with comic legend Lee and Mistress of the Dark Elvira (a.k.a. Cassandra Peterson). How will this awesomeness change your life? There’s a Batman reunion, a cash prize Cosplay Masquerade, and a Quidditch pitch, PLUS Stan Lee’s Zombie Apocalypse. For $30 (separate from the $20 regular admission), you and a like-minded crew of crazies brave individuals can get chased through a 75,000 square foot obstacle course by the gore-ified living dead. Fancy a little flesh yourself? For $75-$150, you can get zombied up, thanks to special effects makeup, and pursue geeks and gamers with corpse-like gusto. Word has it that gamer biceps are particularly toothsome fare. 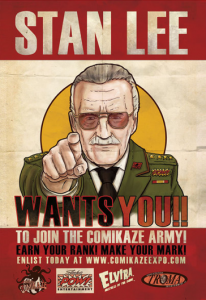 STAN LEE’S COMIKAZE — Sat, Sept 15; 10am-7pm & Sun, Sept 16, 10am-6pm; $20-$60; kids under 12 FREE — Los Angeles Convention Center, Tom Bradley Hall, 1201 S. Figueroa St. Tix/info at comikazeexpo.com. At the Mumbo Gumbo Fest, you too can put crawfish shells on your fingers. 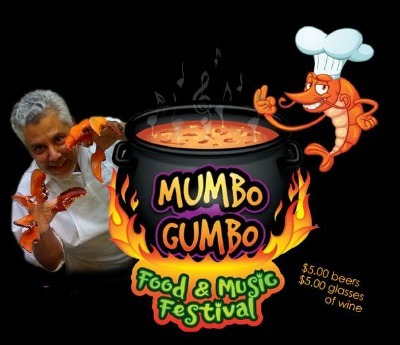 Go Go’ers, if you hear”Mardi Gras” and think of crawfish instead of krewes, you’ll want to head over to the Boston Court Theater Back Lot this Sunday, September 16th and laissez les bon temps rouler at the 6th Annual Pasadena Mumbo Gumbo Fest. Chef Claude Beltran of Noir Food and Drink will be cooking up vats of gumbo and bucket-loads of shrimp and crawfish with the Big Easy’s signature Bananas Foster for dessert. Note to self: not the day to wear a belt. Wash down the goodness with $5 beer and wine and settle back in your chair, cher, while local (and Ms. Go Go) faves Wreck ‘n Sow light up the courtyard along with Grammy-nominated Lisa Haley and the Zydecats. Rosemary’s Children Services Cottage benefits from the proceeds of the all-you-can-eat, $49-$60 feast so you can do good while eating well. And sucking on crawfish heads? Priceless.